After the removal of decay, we use cement or composites (or compomers) exclusively as filling material. A cement filling is yellowish in color, is somewhat rougher than composites and the cost is covered completely by the social insurances. Composite restorations are very smooth and durable but the insurance only covers part of the cost. Even if the cavity looks small from the outside, decay can cause the nerve of the tooth to become inflamed and die off, making a root canal treatment necessary. 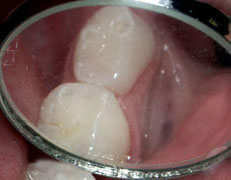 The inflamed nerve is removed and afterward the tooth may need a crown. 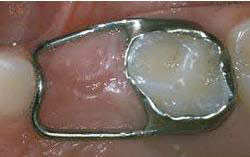 Incorrect treatment (ignoring the problem or opening the tooth) could cause more damage in the long run. If decay has destroyed a deciduous tooth or even made a root canal necessary, a filling will be sufficient and a crown may become necessary. In the molar region crowns made of a special silver-colored stainless steel. For those who do not want silver teeth, tooth-colored crowns are also available but they are more expensive. Early loss of one or more teeth can impede the development of the chewing apparatus as deciduous teeth have an important role in keeping the spaces open for the permanent teeth. In such a case we recommend the insertion of a space-keeper. Depending on the case, the space-keeper can be fixed or removable. If a child loses multiple teeth due to an accident, illness or even decay, it is important to replace these teeth quickly. In such cases, delicate prostheses made of plastic can be made. 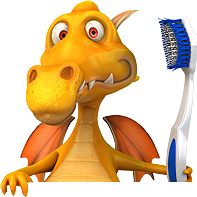 On the one hand the child can chew properly again and even more importantly, the child does not have to be ashamed of missing teeth!